I happened to visit your website and I appreciate your interest and efforts in saving Wild Tigers. I just finished going through the "Volunteers" section. I fully agree with you that tigers are highly endangered and countries like India is doing everything it could to save the last remaining tigers. Even though, your intentions are clear, the methods suggested by you for saving tigers are not correct. I would like to express my opinion on some of the methods suggested by you for saving tigers. I have quoted some of the points raised by you and my take on these points. 1. JV: "Lakshmi Mittal the Indian tycoon, is the fifth richest man in the world. He has acquired his wealth from steel, yet not a single tiger park in India is fenced. How is this possible? At the same time there are dozens of examples of parks in Africa which are fenced and successfully contain large cats like lion, leopard and cheetah. At Tiger Canyons we have successfully run tigers side by side with domestic stock by using electric fences. When I ask the Indian authorities why they don't fence their parks, they say there is no budget. Yet India is spending billions of dollar an developing nuclear weapons. How is it that they can't find a budget to separate the human and the domestic stock from the tigers? 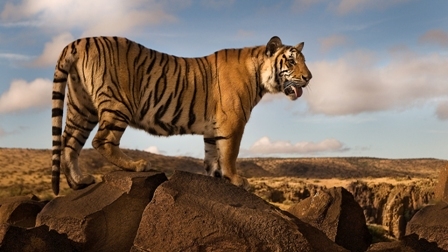 Is war more important than saving a magnificent creature like the tiger? " My View: First of all, it should be clearly understood that tigers are landscape animals and fencing national parks would only prevent their dispersal. You have not told why fencing is required. Can you please give the details on the area of Tiger Canyon. 2. "JV: The second step is to privatize the parks. Get them into the hands of private enterprise. Take the conservation of tigers out of the hands of the government. Follow the South African model where the private enterprise owns more wildlife than the South African government. It's the private enterprise that is expanding land for wildlife by 300,000 hectares per years. Therefore to all Indian people who correspond with me, I say study successful models elsewhere and then create pressure for change in India. Hotel groups in India that rely on tourism, should be encouraged to acquire land which is fenced and stocked with suitable prey. 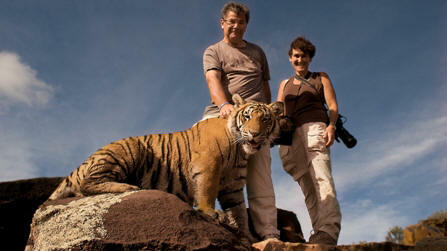 Then the tigers can be introduced and controlled ecotourism developed. Once again South Africa has good examples in its private lodges. " My view: How does privatization help conserve wildlife. Are place like Serengeti, Masai Mara privatized?. The size of the African wildlife reserves are huge, something in the range of 10000 square kilometers, where as an average Indian tiger reserve may measure up to 500 square kilometer. So, models which are applicable for Africa are not suitable for India. Is there any scientific proof that privatization has helped Africa? If so lion numbers should have increased in privatized game reserves. It is well understood that conservation requires In-situ solutions and not ready made/ordered "ELSE WHERE" models. 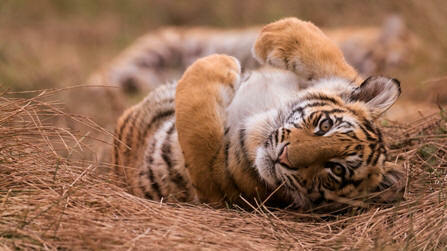 The main reason for decline in tiger numbers is prey depletion. What do you mean when you say "stocked with suitable prey"? Are you suggesting running domesticated tiger farms. You cannot run "PREY Farms" so that later prey can be introduced into tiger farms so that tigers can prey on them. Is there any scientific evidence to show that forest area cover in South Africa is increasing ? When you say Hotel groups should acquire land, what sort of land and where is the land? Hardly 3% of India's land is left for wildlife. 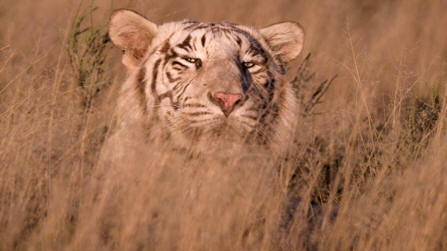 Is it possible to create natural Eco systems/habitats for tigers by buying agricultural lands. 3. JV: "Approach your local zoos and encourage them to acquire land for wild tigers. 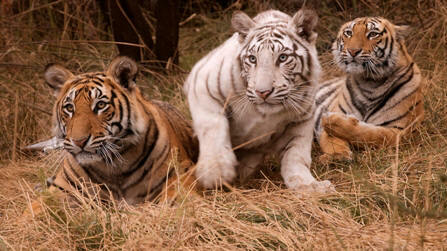 There is an estimated 45,000 tigers in captivity world wide. 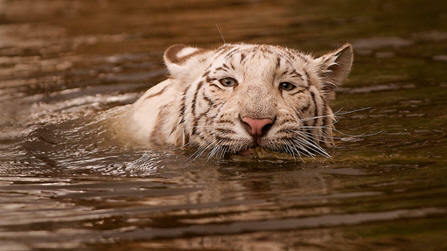 Encourage your zoos to do ex-situ conservation projects with wild tigers. Putting a tiger in a cage is "old think", encourage the zoos to go for wild populations of tigers. " My View: I rubbish your idea of zoos acquiring land for WILD TIGERS and trying to introduce 45 000 CAPTIVE TIGERS. It sound very funny!!! Are you suggesting that all captive tigers should be trained to hunt and then later released into privatized artificial natural Eco system which contain DOMESTICATE WILD PREY? I suggest you first understand tiger's ecology and then then try these "ELSE-WHERE' model approach. Sudhi Prahllada: "First of all, it should be clearly understood that tigers are landscape animals and fencing national parks would only prevent their dispersal". You don't have any landscape. Your population is officially 1.2 billion (other say 1.4 billion). Your parks, or what's left of them, are surrounded by people and domestic stock. The parks are unfenced, so you have conflict between tigers and humans on a daily basis. You are 200 years too late for your landscape scenario. Your tigers are competing with 320 people per square kilometer. Sudhi Prahllada: "How does privatization help conserve wildlife?" South Africa's private enterprise is converting 300,000 hectares a year to wildlife. Governments are notoriously slow to react. Private enterprise acts as the catalyst and when it is a success, Governments follow. Every year in South Africa white rhino, black rhino, sable antelope, roan antelope flow from Government parks into the hands of private individuals because the Government knows it makes good economic sense and the private enterprise will protect it. A private individual just paid R9 million for a 48 inch disease free buffalo bull. This is private enterprise at its very best doing creative conservation. The same can be done with the tiger in the hands of private individuals. Sudhi Prahllada: "Hardly 3% of Indian land is left for wildlife". Has it occurred to you that if you had private enterprise, this number may be a lot higher. If it is 3%, and I believe it is, then your Government has failed dismally to protect your wildlife and by extension the tiger. So what you should be doing, is finding a way for Lakshmi Mittal and others to invest in wildlife and tigers. They will only invest if it makes money. Richard Branson is my neighbour near Londolozi and he has invested in wildlife because it makes money. Sudhi Prahllada: "I rubbish your idea of zoos acquiring land for wild tigers"
There are many examples of the Frankfurt Zoo, the New York Zoological Society, the Toronto Zoo and the London Zoo supporting wild projects in different countries. What I'm suggesting is instead of investing in "old think" like putting tigers in cages, the zoos should invest in land for tigers which is fenced and then stocked with suitable prey and then run commercially. Now they can run the land like we run Londolozi Game Reserve on a multi use basis using tourism, wildlife films, communication, social upliftment, job creation and education programmes into the surrounding community. In short, you invest the local community in the tiger like we have invested our community in the leopard. You run your park on a profitable basis and this is the first step to protecting and saving the tiger. Sudhi Prahllada: "So models which are applicable for Africa are not suitable for India". You must know by now that your Government has set you on a path which has no chance of saving the wild tiger. Your conservation officials in India have failed to learn from the African examples. Lion, Leopard, cheetah have all been introduced back into Pilanesberg, Madikwe, Welgefonden and many private parks. All these areas were once farm land and we now pulsating with prey and predator and tourists. The same can be done with the Tiger. In the beginning of your E-mail you say "I appreciate your interest and efforts to save the wild Tigers". Thank you for this encouraging comment. Unfortunately as your E-mail continues, the questions and comments become confused and your frustration and ignorance become apparent. Sudhi Prahllada: "I suggest your first understand tiger ecology"
I am not the enemy. Loss of home range, loss of prey in the face of 1.4 billion people all trying to survive, is the enemy. 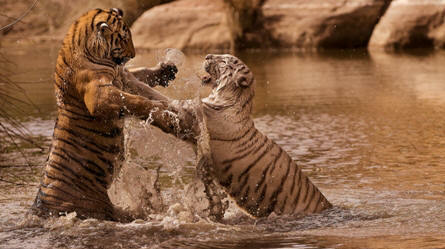 Your Governments inability, to save the tigers is the enemy. Corrupt Government forestry officials involved in poaching is the enemy. The arrogance of your Government officials and their inability to learn from success's in other countries is the enemy. Your failure to invest communities on the side of the parks in the tiger is the enemy. Your lack of political will and your inflexibility is the enemy. Visiting Tiger Canyons are now many tourist that used to go to India. They are now unable to get a decent pictures of a tiger in India, so they are spending the money at Tiger Canyons in South Africa. They fly in planes, they hire cars, they stay in hotels, they come to see, photograph and be inspired by the tiger. This is income that should be flowing to India, but it's not, it's coming to South Africa. Finally I suggest you move out from behind your computer, go and study same examples that work and then try to implement those examples in India. Good Luck! All Images from "Chuffing Tigers"
So to something more positive. Some time ago I said in a newsletter that we must let our pictures do the talking. 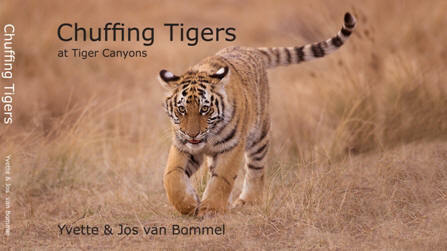 Jos & Yvette Van Bommel have produced the most stunning book called "Chuffing Tigers". The pictures all taken at Tiger Canyons are breathtaking. Tigers swimming, play fighting, in rocks and reeds, every page is an exciting new discovery. Every person interested in cats and the plight of the tiger should have this book. Susanne Baden has also produced a beautiful pictorial record of her many trips to Tiger Canyons. The photographic competition has received many beautiful pictures. I have seen some and they are absolutely stunning. For those who have not yet entered, you have until the 15th of November to enter. Due to the success of this competition, next year's competition will be the big 4 cats. You will be invited to enter a picture of a lion, a leopard, a cheetah and a tiger. Each picture will score points which will be totaled and the winner will again win a Big Cat Safari. Details will reach you in the New Year. Tiger Canyons is producing its first calendar entitled "Tigresses". Many beautiful pictures have been captured with ladies posing with Julie, Zaria and Shine. What fun we have had making the calendar. If you are too small to pose with the tigers, we will photoshop you into the picture. Therefore one to a hundred is our age limit for the calendar. All proceeds of the calendar will go to Tiger Conservation. Tigers have been seen several times while guests were having breakfast on the platform. We are hoping that "Breakfast with a Tiger" will become a regular occurrence. Shadow, Tiger Boy and Shy Boy are free ranging in the new area and rapidly diminishing the prey. Shadow was seen mating with Tiger Boy and Shy Boy alternately. I have only seen this once before with two male lions at Londolozi who were brothers and very compatible. 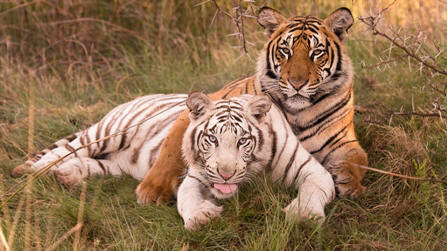 Tiger Boy and Shy Boy are both vasectomised, so no offspring will result. Tiger Boy is the only wild born wild raised tiger that will regularly greet me with the chuffing sound. I regard it as privilege to be greeted by this wild male tiger. The Swamp Male (Sariska) recently did an interesting thing. When challenged by Seatao and Julie, he backed down an antbear hole to protect his rear end. When Julie and Seatao came near him, he swatted them and eventually they lost interest in the fight. Leopard Queen, the film about Manana the famous leopard who lived to nearly 17 years at Londolozi, has come second at the Jackson Hole Film Convention in the USA. If anyone would like a copy, they should contact Sunette. Finally I have a questions for you which I cannot answer. "Why do Tigers reverse into the water?" Please give me your ideas.